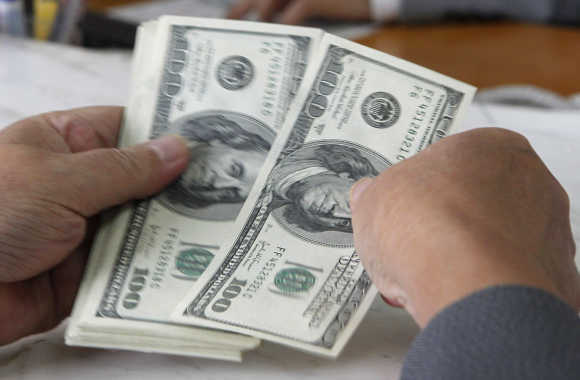 As India gears up to elect its new Prime Minister, the US-India Business Council has come out with a comprehensive wish list, which if implemented, would help in achieving the goal of a bilateral trade of $500 billion per year. The comprehensive action plan among other things includes a demand to resolve the outstanding issues related to the civil nuclear deal, to increase foreign direct investment in the defence sector, e-commerce and insurance and to encourage a level-playing field to global companies in financial sector. The USIBC calls for legislation and implementation of the plan that provides certainty in India's international tax treaties and investment structures. 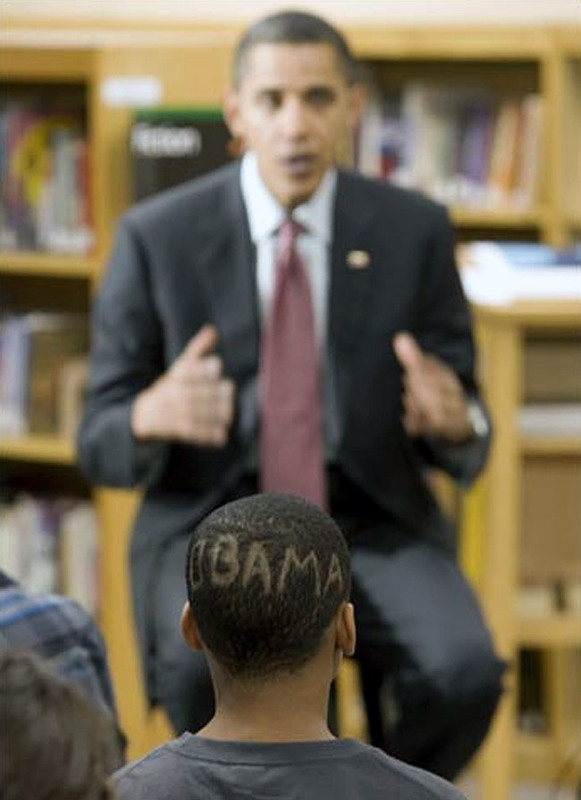 Image: A student with an 'Obama haircut' at Wright Middle School in Madison, Wisconsin. Reiterating its call to opening of India's multi-brand retail sector to support closer linkages between farmers and markets, the USIBC said it would advocate for a fair, transparent and streamlined bidding process in the infrastructure sector. "Derived from USIBC's 300 member-companies, both Indian and American, including 250 of the largest US companies investing in India, this 'Way Forward Agenda 2014-2015' presents the many issues we all need to focus on to deepen the two-way partnership between our dynamic commercial sectors," USIBC president Ron Somers said. The listing is comprehensive, but is also intended to be calibrated as constructive progress is achieved, he said. 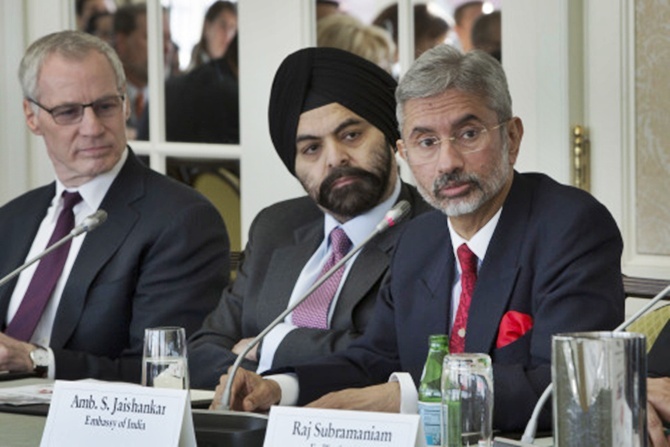 Image: (L to R) Ron Somers, President, USIBC; Ajay Banga, USIBC Chairman and President & CEO, MasterCard; Dr. S Jaishankar, Ambassador of India to the United States. "The facts are that as two-way trade between our economies deepens (now at $100 billion, setting a 'stretch-goal of achieving $500 billion before the decade is out), the issues are becoming more granular and complex. . .but now enjoy a momentum destined to deepen collaboration. “That's the exciting narrative of the US-India growth story," Somers said. Increasing foreign direct investment cap from 26 per cent to 74 per cent would spur greater investment and technology transfer by American defence companies, which would increase opportunities for coproduction, joint manufacturing, and industrial partnerships with Indian industry, the USIBC said. It also urges India to sign long-pending ‘enabler agreements’ and support India's membership in the multilateral export control regimes to enable a more advanced and robust bilateral defence trade relationship. Urging the government abolition of the ‘5 year, 20 aircraft rule,’ to allow low cost carriers and newly formed alliances to take flight and enhance regional competitiveness, it also calls for reducing the general-aviation access clearance time to one to two days and roll back of the duty on the import of private aircraft, as this has significantly stunted growth in the GA/NSOP sector and has hindered the growth of aeronautical infrastructure. In its document, running into 40 pages, USIBC said this year it would work with the Indian government to ensure successful alignment with industry best practices when implementing the Compulsory Registration Order or the safety testing, registration, and labelling requirements. 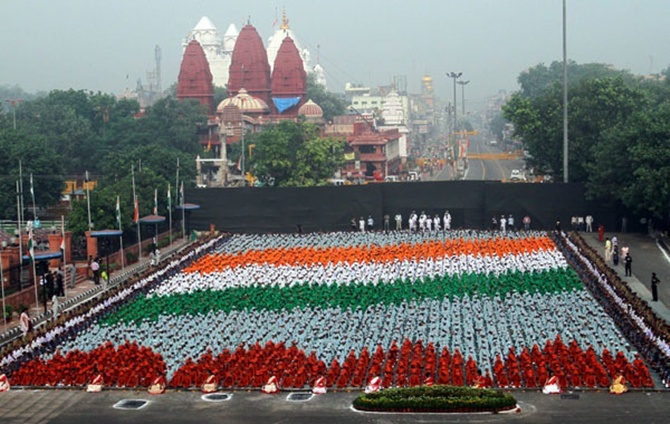 Image: School children in coloured clothes form India's flag as they participate in a full-dress rehearsal for the country's Independence Day celebrations at the Red Fort in Delhi. "We will also continue to seek exemptions for highly specialised equipment and R&D products with low commercial value. “Also, we will continue to seek flexibility on the labelling requirements from the Bureau of Indian Standards while urging GOI to ensure proper coordination between all branches of the government (i.e., customs and BIS) to ensure accountability and mitigate supply chain disruptions for USIBC companies," it said. Urging India to embrace the multi-stakeholder Internet governance model that drives competitiveness and innovation as well as economic and social growth, USIBC said it would engage with New Delhi to liberalise e-commerce in the country by lifting the FDI restrictions and providing national-level treatment, rather than applying state-level conditions, to all e-commerce retail merchants. 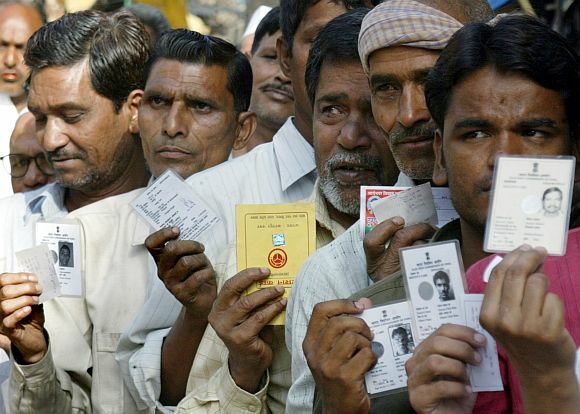 Image: Voters display their election identity cards outside a polling booth in Shahjahanpur, Uttar Pradesh, during the 2007 assembly election. It also plans to press on India to implement policies that promote freedom of expression online and to resist placing inappropriate burdens on Internet companies with the intention of blocking content without due-process procedures. USIBC said it would advocate for resolution of legal and regulatory issues critical to full implementation of the US–India civil nuclear agreement, enabling US companies to sign and perform Early Works Agreements and future contracts. Coming out in support of a strong national manufacturing policy that creates a stable business climate encouraging of US investment in India, USIBC said it will petition for lower tariffs in a range of key components and products that will deepen collaboration between American companies and their Indian counterparts, including current duties on heavy equipment and machinery, gas turbines, and chemicals. 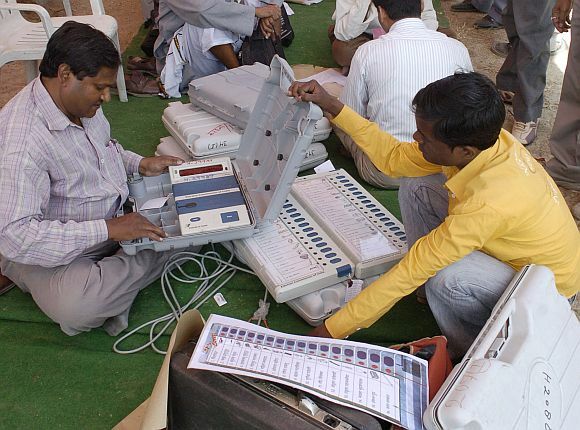 Image: A polling officer checks EVMs in Allahabad. It supports full implementation of India's Infrastructure Debt Fund, ensuring its success as an effective financial vehicle that mobilises investment into India's infrastructure sector. Advocating for the entry and establishment of US law firms in India, USIBC said it will ‘vigilantly resist’ compulsory licensing, acknowledging that measures designed to allow government intervention should be for emergency situations only. Resisting policy backsliding and protectionism in foreign direct investment in pharmaceuticals by advocating against the inclusion of noncompetition agreements in brownfield investments, USIBC said such measures would send a chilling signal to investors, chase capital to other markets, and negatively impact the valuation and ability for domestic companies to grow and collaborate. The USIBC said it will encourage India to pass legislation creating a separate regulatory framework for medical devices. Image: US President Barack Obama meets members of the audience after delivering remarks at the US-India business council and entrepreneurship summit in Mumbai.